This is the next in the series of blog posts on research into applying ICTs to the data capture element of land registration. This blog post follows the previous blog post was titled: Testing ICTs and Affordable Mapping Tools for Demarcation of Land under Ideal Conditions. In the previous post, we looked at how some available and affordable ICTs and GPS units behave under ideal environmental conditions. 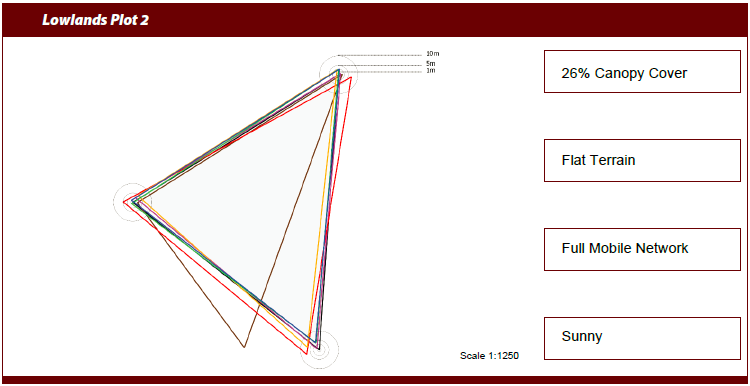 We measured each tool’s relative accuracy and precision over a known trigonometric point in Nairobi. In this blog post, we examine how these same tools behave under varying environmental factors. 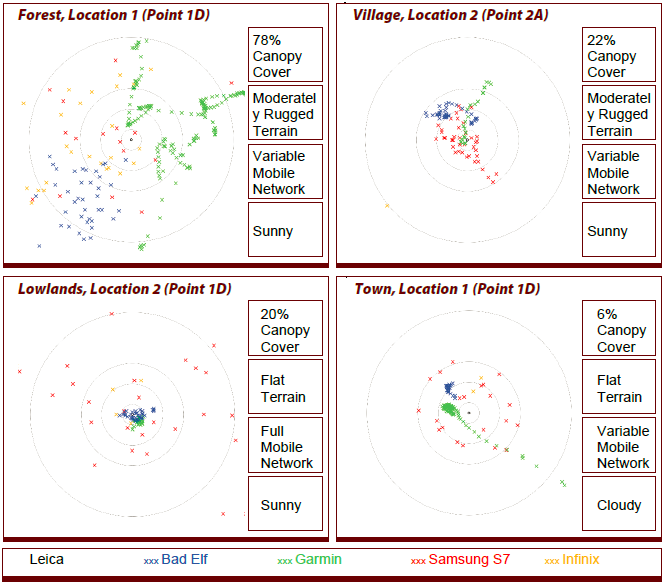 Beyond their technical specifications, the performance of each tool to collect location data is affected by a variety of environmental factors, in particular, those narrowing the field of view to obtain mobile connectivity or be in the line of sight of GPS satellites. 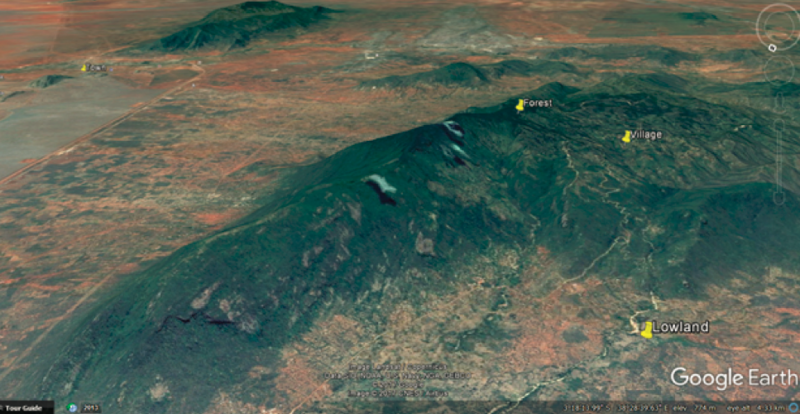 Forested land in the hills (high altitude). Village communities consisting of subsistence farming in the hills (between highlands and lowlands). Savannah, relatively flat farmland with an open canopy (lower altitude). Urban environment represented by the town of Voi (lower altitude). Our particular interest was how canopy cover, terrain, mobile connectivity (for mobile devices), and survey conditions, affect accuracy and precision measurements of boundary points of parcels. The purpose of this exercise was not to conduct rigorous scientific measurements of each tool but rather to test how the environment affects the measurements of locations with a specific focus on the demarcation of land. Eight sites with varying environmental conditions were selected for testing. At each site, a reference point was measured with Leica Real Time Kinematic GPS which is capable of very precise measurements (up to a millimeter). Each device was then placed on top of the reference point where location data was continuously collected for about 10 minutes. We find that environmental factors significantly affect the nature of measurements. Lower accuracy and precision were observed in the forest with high canopy cover and low field of view for all devices. The measurements improved significantly as the environmental factors (canopy and terrain) improved, in the village and lowlands. Relatively high canopy cover and low field of view had the greatest effect on the measurements. 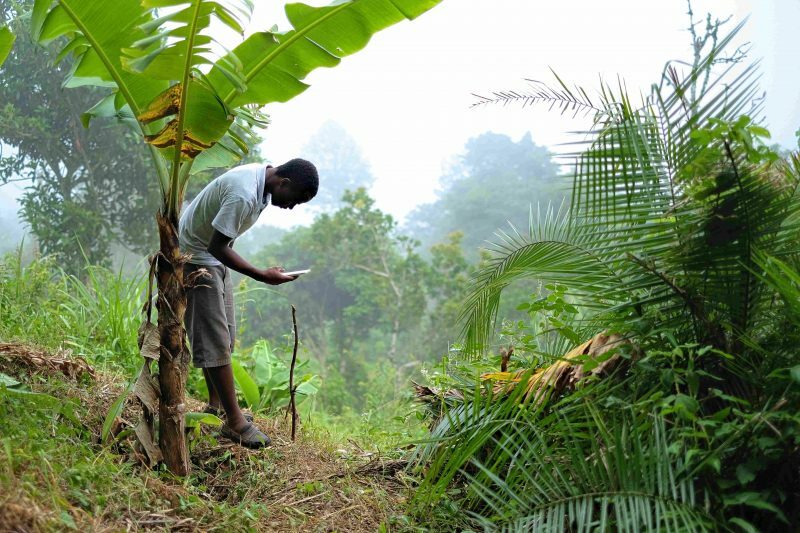 Variable network connectivity conditions were observed in the village and in the forest; however, as the first test in Nairobi showed, network connectivity did not have a significant effect on improving accuracy and precision of measurements. 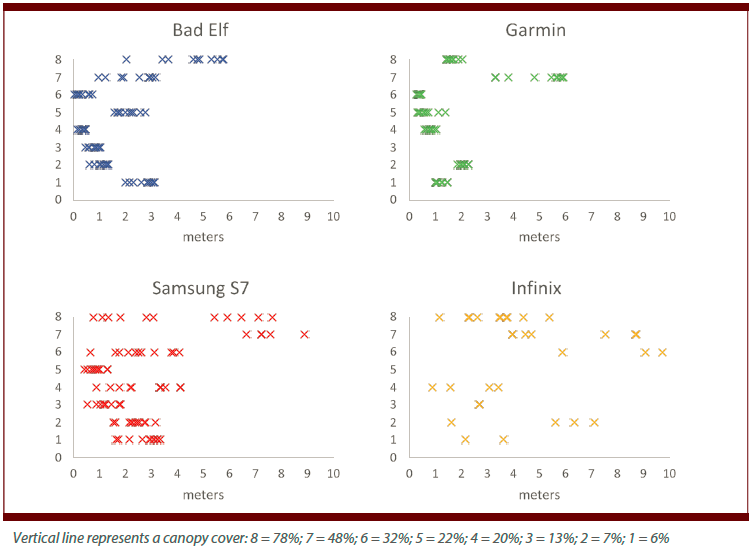 A much higher relative accuracy and precision were obtained by the two GPS devices (Bad Elf and Garmin) compared to the mobile devices. These two devices have superior GNSS chipsets to those of the mobile phones. 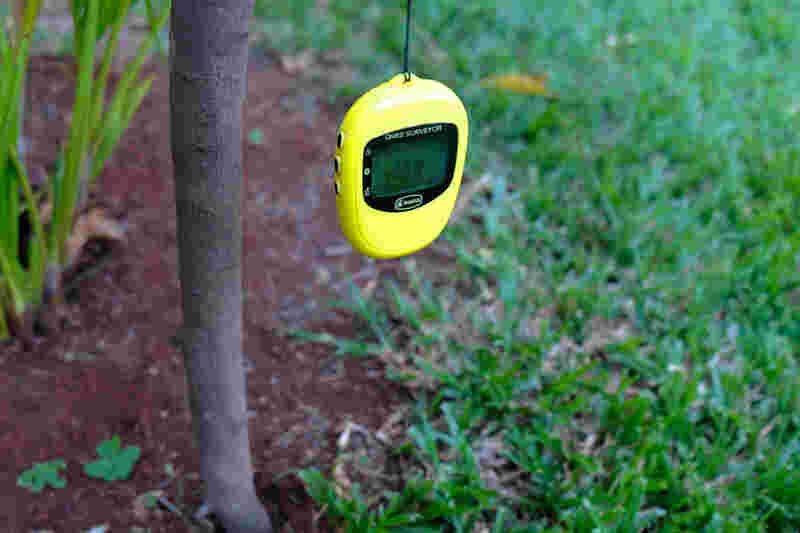 If we place top ten measurements for each device on the horizontal line that indicates the distance measured from the reference point, we see that the measurements have higher accuracy (proximity to reference point) and precision (proximity to each other) under the more favorable environmental conditions (canopy cover and terrain). How do these findings affect individual parcel measurements? 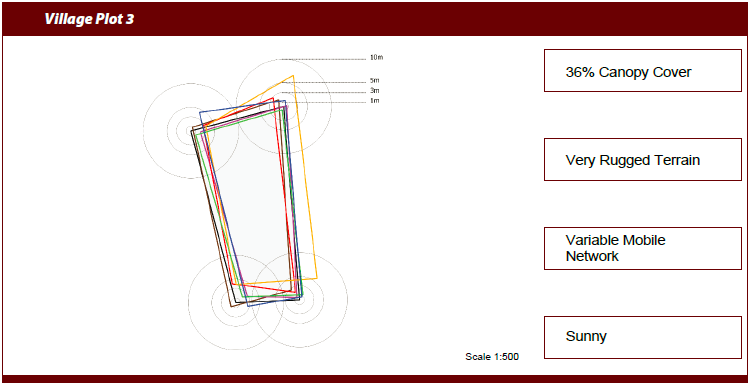 If the previous tests give practitioners a rough idea of what to expect in terms of each device’s relative accuracy and precision as they relate to various fieldwork conditions, the next test indicates how this affects the capture of boundary points and the demarcation of individual parcels. For this experiment, ten parcels with varying environmental conditions were measured with a Survey grade GPS unit (Leica1200 with RTK) for reference. At each reference boundary point, the location was obtained using one of the devices, and specific records of the terrain, canopy cover, network availability, time of data capture, and ability to collect a point on each application were recorded. 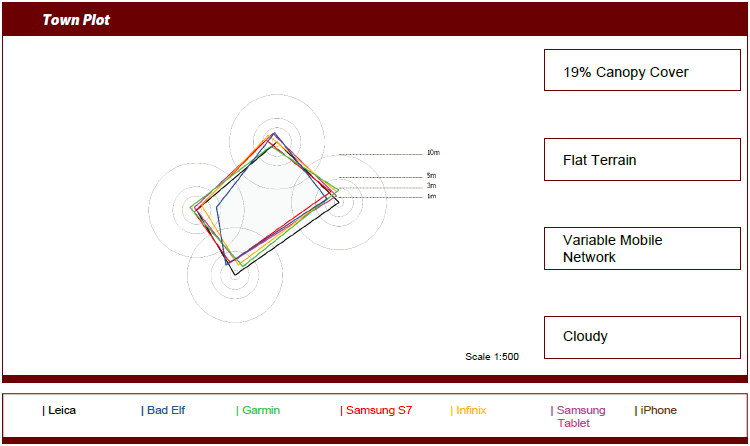 Ten parcels were measured using Garmin e-Trex and Bad Elf GPS units, Samsung S7, Infinix Zero 4 Plus, Samsung Tablet, and an iPhone, and overlaid on top of parcels measured with professional grade Leica GPS. Below are the results from some of the parcels. 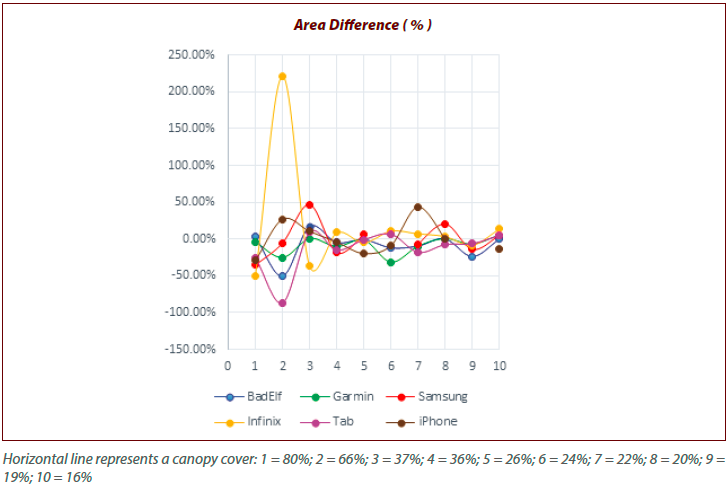 If we compare the areas of parcels measured with each device, we see that the difference in the areas measured changes based on environmental factors. In these measurements, we combined the canopy cover and field of view into one indicator called Canopy Cover expressed in percentage points. 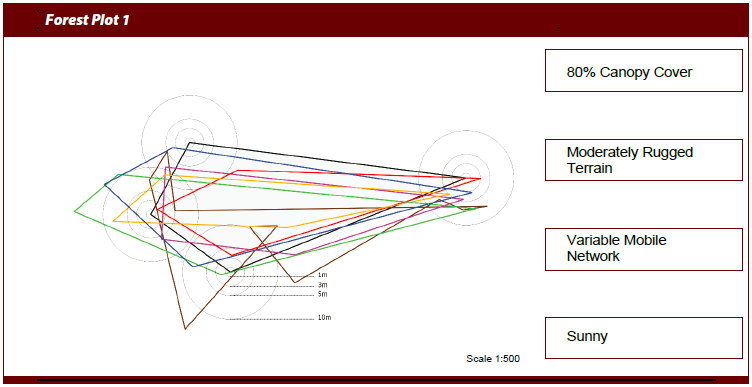 As demonstrated in this chart, the results improved when the field of view increased and canopy cover decreased. Canopy cover and field of view are two things that influence the GPS measurements the most. Did these selected affordable tools reach the threshold in terms of accuracy? These tools cannot reach the accuracy threshold required for demarcating fixed boundaries as these boundaries require three to four-centimeter accuracy under the Kenyan law. Apart from the professional grade GPS unit, none of the tools reached this level of accuracy. However, apart from the heavily forested areas, most devices were able to collect location data within three to five meters, as required for general boundaries. Next blog post will look at whether the communities can replicate the work of a professional surveyor using these technologies.